Eva says… You know, when I read some of these books and look at those movies on Facebook, I get the feeling that a lot of people really don’t LIKE foxes! And I don’t get that. Because they’re BEAUTIFUL with their floofy fur and plus their babies are CUTE. But there’s that whole chicken thing that I think farmers don’t like. But farmers aren’t everyone. 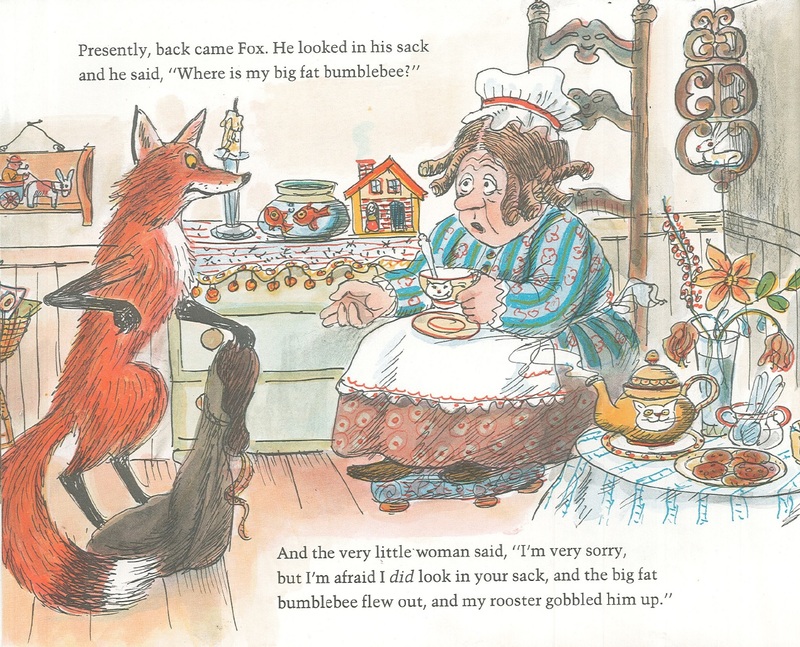 Anyway, there was this old book I read about this mama fox who wanted to have her babies but people kept throwing stuff at her and being mean even though it was snowy (Fox’s Garden by Princesse Cam Cam) and now there’s THIS one. And what happens here is, this fox catches a bumblebee and puts it in his sack. And then he tells that old lady “Don’t look in my sack.” But then as soon as that fox leaves, guess what that old lady does? SHE LOOKS IN THE SACK ANYWAY! And the bee gets out and gets eaten. So the fox takes her rooster but all the way through the whole book, he just keeps saying “Dude, don’t look in my sack,” but everyone just goes right on ahead and does it anyway. And I think that’s real ignorant. So maybe the problem isn’t foxes, but people minding their own business. And maybe if people RESPECTED foxes, then they wouldn’t steal chickens and stuff. And maybe everyone should THINK about that.